7% Goods Service Tax (GST) will be imposed over the total invoice value if purchased locally in Singapore. However if you are a tourist visiting Singapore, this GST amount can be refunded at the Changi International Airport Departure Hall / Seletar Airport Passenger Terminal / Marina Bay Cruise Centre Singapore/ International Passenger Terminal at Harbourfront Centre GST Refund Centre before departure with goods within 2 months from the date of purchase. Please note that only Tourists who have met the Tourist Refund Scheme's conditions and eligibility criteria can claim for the GST refund. Please visit: https://www.iras.gov.sg/IRASHome/GST/Consumers/Tourist-Refund-Scheme/ for GST Guide for Visitors on Tourist Refund Scheme. Fits all Sennheiser evolution wireless (ew) series (G1, G2, G3) belt packs 100, 300, 500 series. Use almost any brand of lapel, clip-on, headset microphones on Sennheiser’s evolution wireless (ew) series with this replacement jack. An ideal choice for ENG/EFG operations. The professional high quality sound offer you a hassle free sound re-production. Requiring only 2 x AA bateries for its receiver which is favorable choice to any professional cameras and even DSLR cameras. The receiver EK100 is made of Rugged metal body . Sound pressure level (SPL) 154 dB(SPL) max. When can I take advantage of the Trade-in offer? Sennheiser is offering this fabulous trade-in program from October 1, 2016 to December 31, 2016. It&apos;s a great way of not only saving some money for your old wireless inventory, but it allows you to grab a genuine bargain – especially useful at this time of year. Whether you&apos;re a small business needing to purchase useful items with the tight budget or a school/government organisation who&apos;d like to optimise the &apos;use-it-or-lose&apos; nature of funding and budgets, end of the year is most certainly the right time to act. Full details of the Sennheiser Trade-in? If you&apos;ve got an existing unusable wireless system that sitting in your office or home, do you chuck it in the bin? NO! Sennheiser is offering a trade-in for your old system. It does not matter what it is. It could be an old Sennheiser, AKG, Shure, Wizycom, EV (ElectroVoice), Samson, Sony, Beyer Dynamic, Lectrosonic, Line 6 or other brand you can think of. All you need to do is bring it in to Sennheiser, and trade in when you purchase a new Sennheiser system from us. More importantly, it won&apos;t be re-sold, nor can it end up being used for evil purposes. It will be disposed off in the environmentally way! 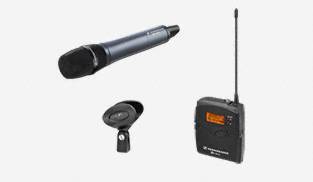 It&apos;s quite straightforward – you can hold onto your old wireless systems, and throw them out yourself with no trade-in bonus, OR you bring in the old system and turn it into a handsome cash back on your next purchase of Sennheiser wireless system. Could I trade in the individual transmitters or receivers, purchased separately or in contractor bundles instead of the whole set? I was told to send the item to Sennheiser for their assessment and I probably could be rebated at half the system rebate value. Which systems are eligible? ANY Sennheiser Evolution wireless system qualifies?